This page is supported by WikiProject Elements, which gives a central approach to the chemical elements and their isotopes on Wikipedia. Please participate by editing this article, or visit the project page for more details. Project This page does not require a rating on the quality scale. WikiProject Elements was featured in a WikiProject Report in the Signpost on 20 June 2011. If you wish to get involved with the Signpost, please visit the Newsroom. WikiProject Elements was featured in a WikiProject Report in the Signpost on 23 October 2013. If you wish to get involved with the Signpost, please visit the Newsroom. This talk page is automatically archived by MiszaBot II. Any threads with no replies in 30 days may be automatically moved. Sections without timestamps are not archived. 2 "element with symbol" or "element with the symbol"
5 Origin of name "flerovium"
I doubt it. While, for example, alkali metals are clearly first and foremost a specific set of elements that often go together, this is not the case with metals, which is first and foremost rather a singular term that applies to many elements. The word "metal" simply has too much value on its own to be considered primarily as a subset of the chemical elements. An article titled [[nonmetals]] seems like it would describe a definite class rather than a type of substance, so I would expect to see an article about a definite class of 17± specific chemical elements. That's the point, albeit inversed. What you see here is: Na is in the class of alkali metals, good. The class is defined by itself, not by listing its elements. (Not: "FC Barcelona team is these eleven players", but "These eleven players are in the FC Barcelona team"). The class is not defined by its member list. Sure one can write & link: "Sodium is an alkali metal", still then the article starts with: "The alkali metals are a ...". The class is the predominant meaning, and so it is used in the legend. And sure, plurals in the legend do not break the reading or intention, it's about one's understanding. After step 1, we can propose to change the article titles. That proposal (step 2) is in my User:DePiep/sandbox2. "element with symbol" or "element with the symbol"
Germanium is a chemical element with symbol Ge and atomic number 32. Germanium is a chemical element with the symbol Ge and atomic number 32. Germanium (symbol: Ge) is a chemical element with atomic number 32. Actually, I thought this discussion had to do with making the FA blurb acceptable to those who objected to the absence of "the". I was not offering my alternative as a suggestion to modify all 118+ articles, though that could be taken up separately. The definite article is used to refer to a particular member of a group or class. It may be something that the speaker has already mentioned or it may be something uniquely specified. There is one definite article in English, for both singular and plural nouns: the . No, again, to this: a symbol like 'Ge' is not an universal symbol, so not a 'the' symbol. Duh? You asked for clarification, I clarified, then you say "repetition"??? You did not explain, you simply repeated your assertion. Where is this so called rule artuculated? I know quite well that it is a symbol, I lesrned that many yesrs ago in middle school. And the grammar comment was about the use of "the". The above discussion is considering only two choices, but there are many others; listed here using carbon. Carbon is a chemical element having symbol C and atomic number 6. Carbon (symbol: C) is a chemical element with atomic number 6. Carbon (C) is a chemical element with atomic number 6. Carbon is the chemical element with symbol C and atomic number 6. Carbon is the chemical element with the symbol C and atomic number 6. Carbon is the chemical element having symbol C and atomic number 6. Carbon (symbol: C) is the chemical element with atomic number 6. Carbon (C) is the chemical element with atomic number 6. (a) Carbon is a chemical element with symbol C and the atomic number 6. (a) Carbon is a chemical element with the symbol C and the atomic number 6. (a) Carbon is a chemical element having symbol C and the atomic number 6. (a) Carbon (symbol: C) is a chemical element with the atomic number 6. (a) Carbon (C) is a chemical element with the atomic number 6. (a) Carbon is the chemical element with symbol C and the atomic number 6. (a) Carbon is the chemical element with the symbol C and the atomic number 6. (a) Carbon is the chemical element having symbol C and the atomic number 6. (a) Carbon (symbol: C) is the chemical element with the atomic number 6. (a) Carbon (C) is the chemical element with the atomic number 6. "A metallic element, obtained from zircon as a black powder or as a greyish crystalline substance. Symbol Zr." Zirconium is a lustrous, grey-white, strong transition metal that closely resembles hafnium and, to a lesser extent, titanium. Its name is taken from the name of the mineral zircon (the word is related to Persian zargun (zircon;zar-gun, "gold-like" or "as gold")), the most important source of zirconium. It is mainly used as a refractory and opacifier, although small amounts are used as an alloying agent for its strong resistance to corrosion. It forms a variety of inorganic and organometallic compounds such as zirconium dioxide and zirconocene dichloride, respectively. Zirconium is the 40th member of the periodic table of chemical elements, and is denoted by the symbol Zr. Zirconium (Zr) is a lustrous, grey-white, strong transition metal that closely resembles hafnium and, to a lesser extent, titanium. It is the 40th member of the periodic table of chemical elements. Zirconium (Zr) is a lustrous, grey-white, strong transition metal that closely resembles hafnium and, to a lesser extent, titanium. It the chemical element with atomic number 40. I can support going to the "Zirconium (Zr)" opening (still wondering if the symbol should be bold). Moving the atomic number further away from opening (as YBG illustrated) is positive, because it allows for opening with a strong, readible sentence, highlighting main properties and reducing jargon & code. I reject this idea: "Zirconium (Zr, atomic number 40)", because too much bracketed text (glad we got rid of the pronuncation soup there). Still, the notion "chemical element" (as opposed to compound) is required, and in top. Comes to mind that the link chemical element is not in the infobox?! 100. "Zirconium (Zr)" -- Article opens with name in bold, then symbol in brackets, not bolded. 200. Opening sentence: Free. It best be strong, catching, well-written, highlighting the element (not: ...?). Readability. 300. "chemical element": this clarification is required in the opening sentence imo, because readers must be told this is not a compound (diff: water - gold - stone, somehow). So we need, like: "gold is a chemcal element". Can be/is this word+wikilink in the infobox? 400. Atomic number: I don't know. It's in the infobox. Need to mention this in opening section? Q01: Reader's interest re gold, re seaborgium? Q02: Differentiate this proposal per set, like: He is not Sg? (A? : a more free first sentence can solve much of this). 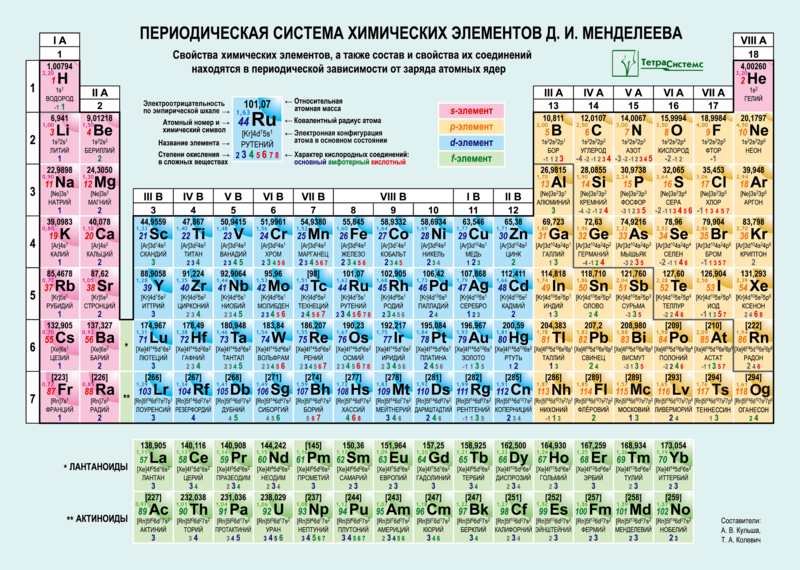 @R8R: could you please look up one of Mendeleev’s articles? The citation is Zhurnal Russkoe Fiziko-Khimicheskoe Obshchestvo, 1869, 1, 60–77. The article may be "On the correlation between the properties of the elements and their atomic weight". The bit I’m interested in is note 2, where Mendeleev says in part, "It appears to me that the most natural approach would be to construct a cubic system (the one recommended is exactly this). However, the attempts at such construction have not led to any real results." This quote is from Jensen’s 2005 book, Mendeleev on the periodic law: Selected writings, 1869–1905. It comprises English translations of German translations of the original Russian sources. Nobody seems to know what to make of the subject passage in Note 2, which makes me suspect the translation was bad. The question is, what did Mendeleev have in mind when he referred to a "cubic" system? The one he recommends in his article has nothing cubic about it. It is the same as the flat one published in 1869, in Zietschrift für Chemie, 12, 405—406. In 1911, van den Broek attempted to design a "cubic" system, based on Mendeleev's note 2. According to van den Broek his system was "[a] cubic system, consisting of five major periods, three small periods of 8 elements, and therefore a cube fives places high, three places deep and eight places wide, with 120 locations". In each case, the elements shown diagonally are those that are supposed to represented along the third dimension. Mendeleev in your quote says that "the attempts at such construction have not led to any real results." Given that, it rather makes sense, it makes sense he did not publish a cubic periodic table because he was unable to find to construct one. An English translation of your article is freely available on the Internet. After reading his explanation (note 2 in the end of the article), I was unable to figure what kind of a cubic periodic table he had in mind (but maybe you can understand his line of thought?). He did not provide a sketch of what that would look like because, as I mentioned, he was unable to formulate what it should have looked like. Here's a 32-column table which aims to resolve the La v Lu question, through a synthesis or rapprochement of each camp. A chemistry book chapter on this group 3 would make fascinating reading (a good thing given, to date, that group 3 is supposed to be the least studied group). Note the distinction between the 14 element wide f block, and the 30 elements of the Ln and An. The black shading of the pre-transition metals can take some getting used to. Even so, I couldn’t go past the beauty of the black and white analogy. While I feel the split-d block version offers more richness this is no longer a show-stopper for me. I'm not suggesting we adopt this table. I've posted it here only in the context of the IUPAC project on the composition of group 3. @Double sharp: @R8R: @Droog Andrey: @DePiep: I hope you like it. Here is the same periodic table in 18-column form. I do not want to promote any 18-col form (32-column form is much much clearer), but I created this one to prevent bad or plain wrong 18-col forms to appear. It is a true cut-and-paste from the original 32-col form (as any good 18-col PT should be). No information was changed. I added "f-block" to the box below, as the word nicely and correctly fits there: it is the complete f-block. I choose the U+2606 ☆ WHITE STAR (HTML &#9734;) instead of asterisks to indicate "This is describing the 3-bifurcated structure" (sort of, just like we use 2-asterisks vertical aligned to indicate "group 3 = Sc/Y/La/Ac form"): a nonbinding indicator. I note that we cannot use the words "lanthanides" and "actinides" below (as older PTs often do), because these two categories are cut and split in this PT. This absence is not a loss. At enwiki we abandoned this habit some time ago (for the same reason, plus that we consistently don't write other category names in there either). When drawing the same PT but having group 3 "left" being Sc/Y/La/Ac and group 3 "right" being Lu/Lr (split d-block, as enwiki does today) which as Sandbh stated is equally correct for a bifurcated group 3, the bottom rectangle would be 58–71 and 90–103 (with the "3" above Lu/Lr), but would *not* be the f-block. The "f-block" addition may be superfluous since there is an f-block flag below the f-block already. That's interesting about drawing this form in a split-d format. It probably doesn't matter that Lu/Lr would not be f-block, since in the current version La/Ac don't have any f-electrons either. You're going to have a discrepancy at one end of the f-block or the other. Since the block designations represent an idealised or pure form that doesn't exist in our universe, I may've been placing too much emphasis on the discrepancies as a way of guiding the group 3 question. I was partly inspired by this image. Note the retention of the old school group numbering system, per Double sharp, and the identification of La-Ac as group 3B. Huzzah! Helium is correctly shaded as an s-block element. The inset in the gap between the s- and d-elements shows the simplified or idealised filling sequence. The periodic table shows the purported actual filling sequence. Rather than renting the d-block asunder by moving Sc-Y- to the left, over La-Ac, group 3 has two branches after Y: an La-Ac branch, and an Lu-Lr branch. The principle of one group one place is retained. I know of no IUPAC convention or recommendation the prevents a group from having two branches as shown in this way. La and Ac are rightly shown as d elements. Depicting Lu and Lr as f elements rather than d elements is inconsistent with the depiction of helium, at the end of the 1s row, as an s-element. OTOH, if Lu and Lr are shown as d elements that would result in 42 d elements, two too many to be consistent with quantum mechanics. That said, if group 18 can have one s element and six p elements there is no reason why group 3 could not have four d elements, and two faux-f elements. I think, however, that our expectations are unrealistic. There is the idealised filling sequence exemplified by the Madelung Rule (the inset). Then there is the real filling sequence (per my 32-column table). We try to cobble these two ideas together which, in my experience, has always resulted in disharmony and confusion because every author I’ve read that takes this approach fails to fully explain what is going on. Incidentally he treats the Ln as Ce to Lu. In the Sandbh PT (2019-04-07), there now are two columns headed "3", depicting the single group 3 bifurcated. One column contains La, Ac, the other column contains Sc, Y, Lu, Lr. It might be useful and needed to be able to differentiate between those two columns. For example, when the bifurcation is the topic (as it is in this PT, and likely in article Group 3). In history: I note that until recently, there always has been multi-columns with single group id: VIII has three columns (now 8, 9, 10). reuse A, B? Above, Double sharp suggests to reintroduce the A, B group notation (whichever form: CAS or European: an irrelevant difference in this), because of an other topic/discussion ("group 2 and 11 could be considered forked too"). First of all, that is a different discussion, and unclear, for now, is whether the outcome would be "forking" too. More important is, that for group 3 this would not solve anything in a helpful way: the columns (=6 elements) were, dependent on current group-3-presentation, either in "group IIIA/B" or "n/a" (=had no column number ever). I don't see any advantage to differentiate by writing "group 3, those formerly IIIA" and "group 3, those formery group n/a" (while still not identifying both new columns!). Adding to this: reusing any "A/B" notation would add a third notational form with A/B: which is excactly why that notation was abandoned in the first place, when being just two! And we should not forget that the A/B notation used Roman numbers ("IIIA"), never arabic ("3A"). For these reasons, we should reject the suggestion in the bud. Still, to describe the issue Double sharp points to (re groups IIA, IIB), the old notation is perfectly fine & useful as is. Exact form can be improved, point is that we use their block letter to distinct. Interpunction may matter; block letter always upright not italic. IMO, writing "3d, 3f" would be too confusing for example re elconfig. group 3La, Ac; group 3Sc, Y, Lu, Lr. This is more descriptive, eg in introductionary texts. As before: by top element?. In general, we identified columns/groups by their top element: "The cobalt group" (which is not the same as "group VIII"). So in this case we could use "lanthium group", and "scandium group" respectively for the two columns? No, IMO. While probably correct by Red Book nomenclatura (cobalt & scandium are equal, right? ), it may cause confusion at least. The cobalt example specifies one column out of three, and is never disputed. But the scandium example still is from an unstable PT form (not yet accepted scientifically; only when this bifurcation is accepted everywhere in RL stability might be in play). More fundamentally, as Sandbh described, the Sc, Y pair just as correct could be above La, Ac (as enwiki does today). For this, writing "scandium group" is ambivalent (ambiguous), and so requires clarification and includes implicit confusion. Now this could be true for the "group 3(?-block)" notation too (because a Sc, Y, La, Ac column is not a simple 3(?-block) column; but we know what we refer to because it is new notation. IOW, writing "scandium group" under a "group 3 = Sc, Y, La, Ac"-PT (=current enwiki) is a red flag. Elsewhere. Below, Sandbh mentions #Silberberg's table. in there, this notation would not fit because the block letters change within a column. That would require more descriptive text (at least once, then use like "3 (d/f), 3 (f only)"? Of course for ease of writing, we hope this form does not prevail ;-). Far out! That's a considered post, DePiep. My simple view of group 3 as per the Silberberg table is that it's made up of Sc, Y, La, Lu, Ac, and Lr. It's more complicated that, of course, since there are two branches after Y. So, were you to write about group 3 from this perspective you'd have do a bit of comparative chemistry between Sc-Y-La-Ac, and Sc-Y-Lu-Lr, in order to be clear as to what's going on. How would you refer to each of this options/columns? Good question. There's only one group 3. I'd be inclined to call them the La branch, and the Lu branch. That would be analogous to the approach taken by Jensen (2018, p. 260) re groups 2 and 12: "This is resolved by placing the Ca branch in the (2+6) [i.e. group 2] and the Zn branch in [the same] group." On group 3, Sidgwick treats this as Sc, Y, La and the 14 succeeding elements up to Lu, and Ac. Sanderson does not have anything useful to say about group 3. A short item about the various layouts of the table, based on interviews with Eric Scerri, Philip Stewart, and myself. Tell Eric Scerri, Philip Stewart, User:Sandbh: do not ever use an 18-column periodic table again. (It has caused enough trouble, as they all know). Wheatever you want to say: say it in 32-columns (>=32).